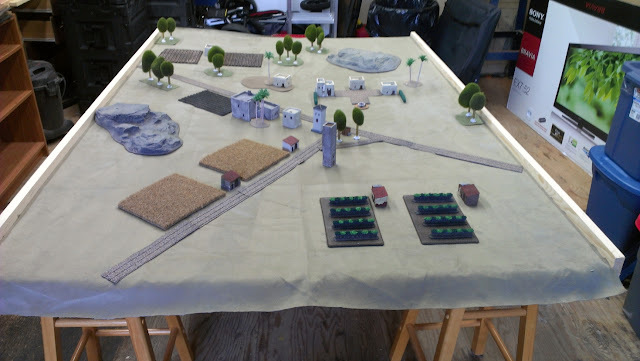 Most games that require terrain such as Flames of War require enough to fill a 6'x4' table. Setting up the table so that it is 'fair' to both the attacker and the defender is key. 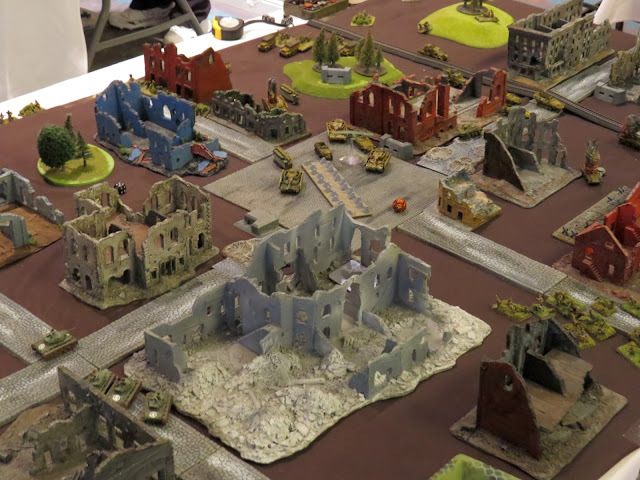 Today I offer some tips in setting up tables for Flames of War, but this can be used for any other tabletop wargame. Make do with what you have and use some of the pictures as guidelines. First thing you need is a theme. 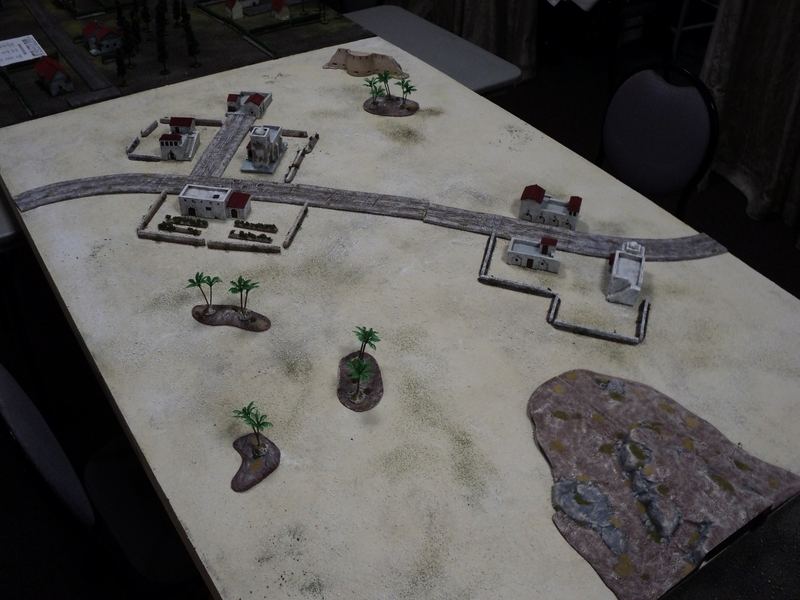 In this case, a desert table can be just that, a simple table with very few pieces of terrain, yet in each of the four corners of the table there are options for defending armies to make use of. There is also enough open areas, Attackers can move about freely. 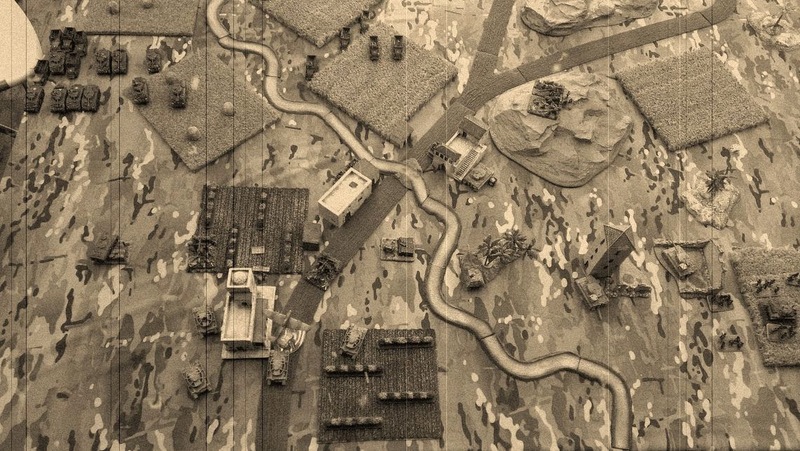 As is the case in most desert boards, the landscape frequently results in armies going at it in the open and seeing who remains as the victor once the dust has settled. 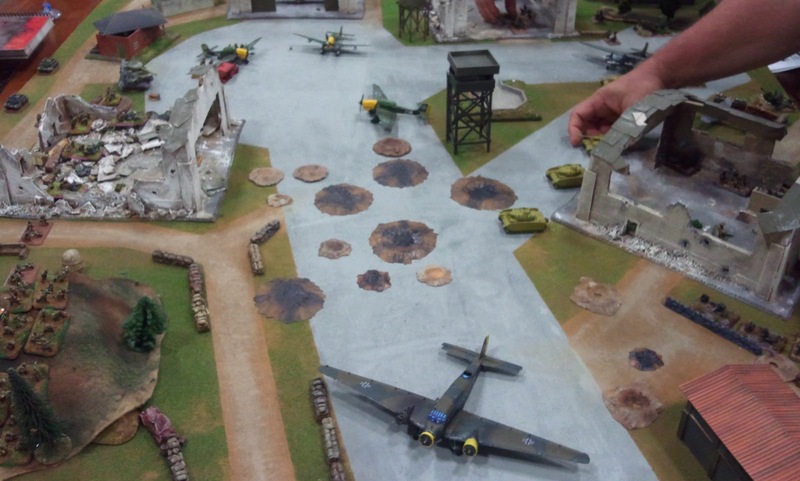 I'm thinking the Germans came out of this on the losing side. 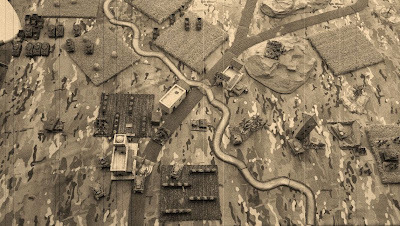 Just by adding some more buildings and some 'area' terrain, desert battles become more strategic and take a little longer when it comes to playing most missions on them. 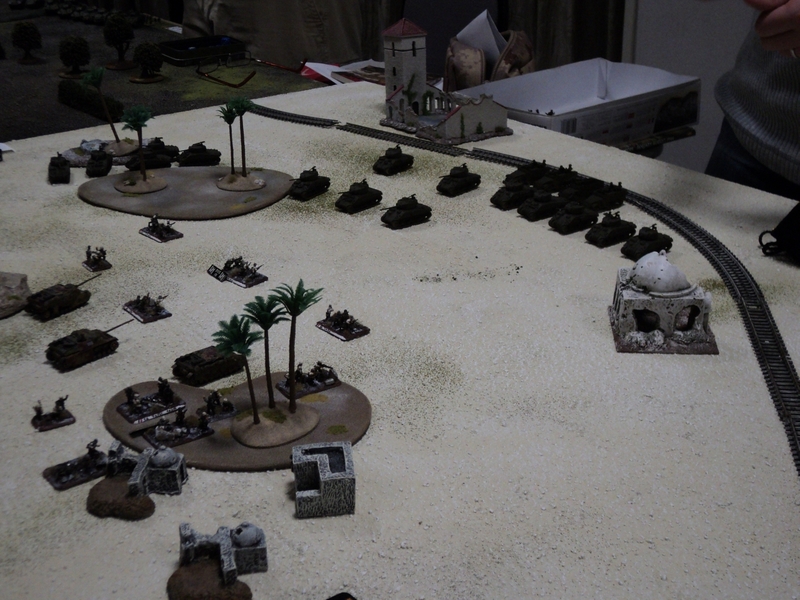 Careful movement of armor has to be taken into consideration if there is enemy infantry lurking in the buildings. With the changes to aircraft, you have few options in which to place your air support. The base has to now be 2" away from any area terrain or building, no more flying down streets between buildings looking for targets. So now you're worried about timing out, something else to think about when setting tables up. European Theater of Operations, even though we have a river/chasm dividing the table, there is also a rail line. Roads, rails or rivers are great ways to create a simple design, you've already divided it into four quadrants. Now you add a few buildings or area terrain to each and it's easy to see if there is one side that has more terrain than the other. We can also see there is a bridge crossing at each end of the ravine running through the center. This makes the table a little more even on both halves. The attacker and defender have a good mix of cover and no one side is at a disadvantage, there's also enough open area to move your units around freely. This allows for a more 'fluid' game, taking time into account is important. A little too much? 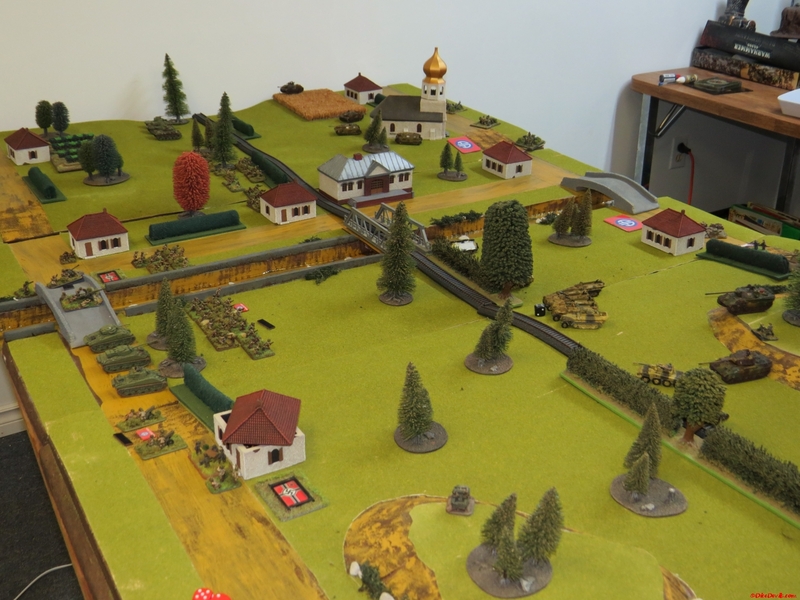 This looks like a great table, but you can tell movement will be restricted, bog checks will be plentiful and chances are the game will go the distance. I'd remove a few items on the table, a great table for casual games, but I think this table would give the defender a huge advantage and 'Sitzkrieg' would take over in a tournament. By the time the attacker is close enough, the game would only likely have one or two turns left. A simple design with very few pieces of terrain used. Large pieces, such as fields and rocky hills are great ways to fill space without compromising simplicity. Less is more? 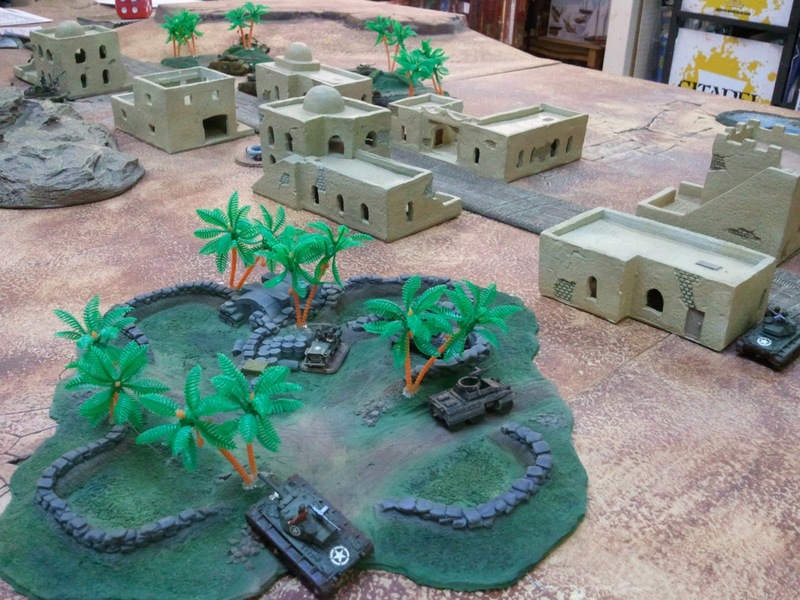 A bit of a stretch in terrain here, we could add a few more pieces. You know both sides are going to meet in the center. While this table provides a quick game, it does limit the strategy you could apply when playing most of the missions in Flames of War or other tabletop wargame. Just not enough stuff, just another example of a very sparse table and even though it's 'equal' for both players. A few roads or a river with a bridge might just be enough to bring this table to life and make it a little better. Don't be afraid to think outside the box. Even though there are aircraft all over the place, talk with your opponent. 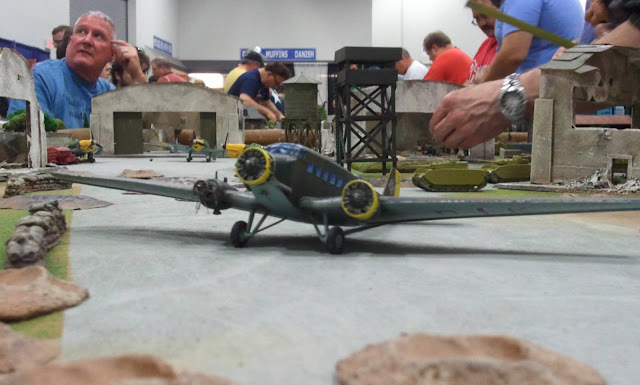 Most of the time, it's there to generate a theme and you don't have to use the aircraft as linear terrain and can move them around if you want to occupy the space they are in. 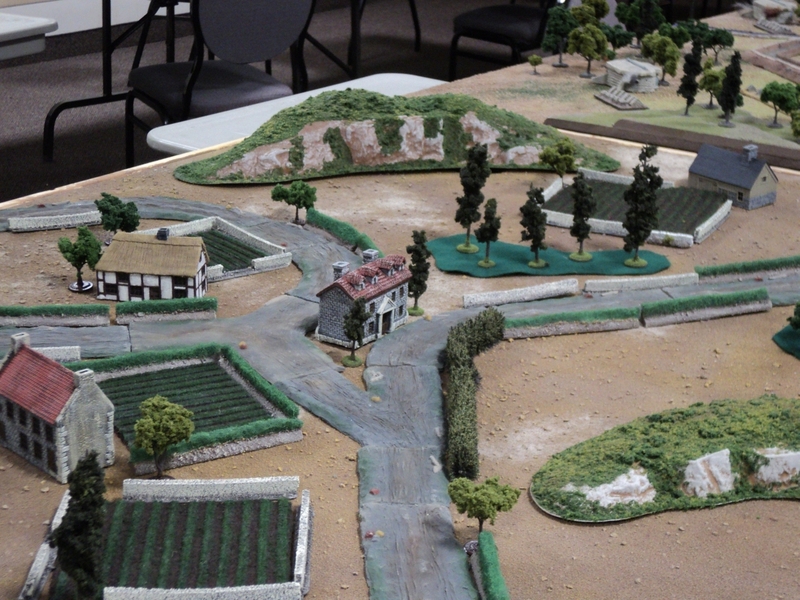 City boards are likely the only time you will see very large pieces of terrain like the ones pictured here. Even though it looks overwhelming, the surprising thing is that most players avoid using them and a lot of the fighting is in the streets or at distance when armored units prefer to stay at long range and exchange fire. The Germans move into the center of the city square and come under fire by the US. Not a lot of places to hide armor. Infantry can move around without the threat of being seen, but if you want to win the game you'll need to move into the open eventually. 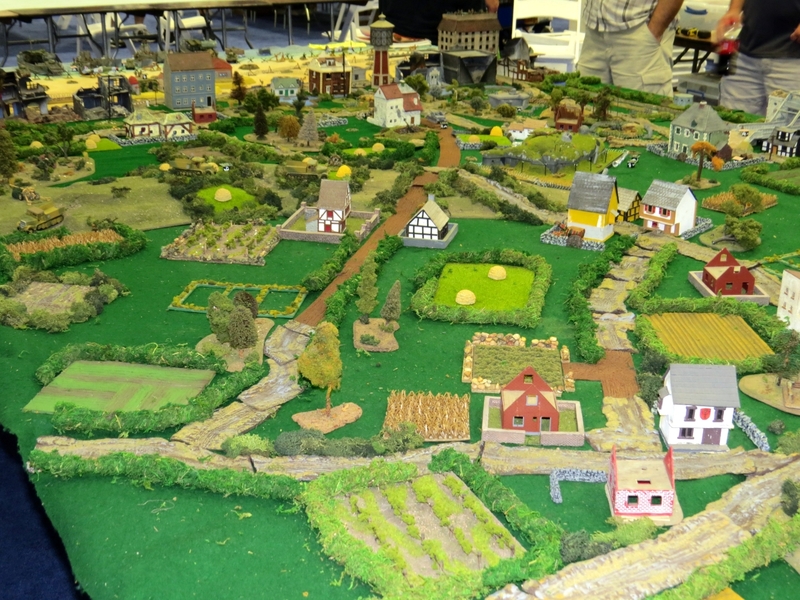 So, even though there is quite a few buildings/ruins on the board, it's pretty even for either side to occupy. If you can see it, take the shot! Just because there are huge walls everywhere, doesn't mean you are safe! Go big or go home. 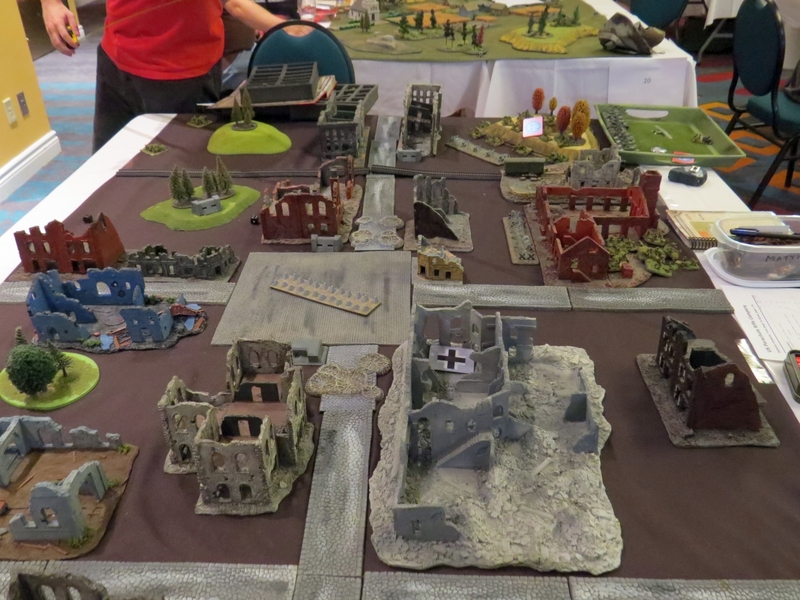 This table was setup at an event for a big scenario, try not to make your standard Flames table look like this. Do you find that the table layout depends on the force (list) used by the table setter-upper (oh, it's a word)? I've never thought about that. For the most part, when I know we are getting together, I usually set tables up well in advance and even before I know what list I am playing. I don't think this plays too big a part, as you don't know a few key factors. One, it's unlikely you know what list you are 100% facing off against. Two, you have no idea whether it will be a lengthwise or short board edge mission. 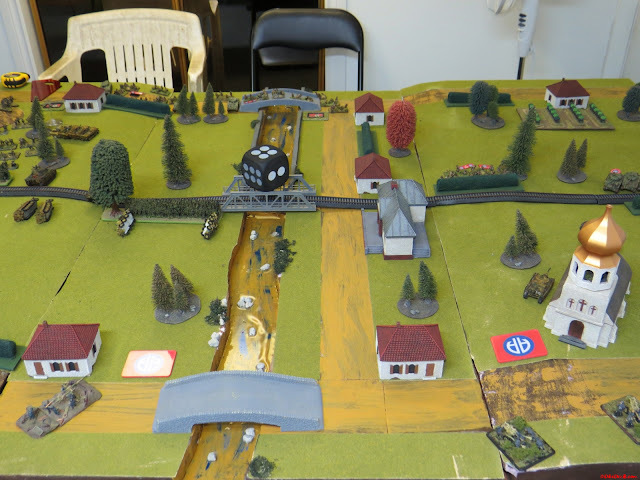 If a table looks odd or unbalanced, most players will pick up on it and I think setting up the terrain has no bearing on % of victory.